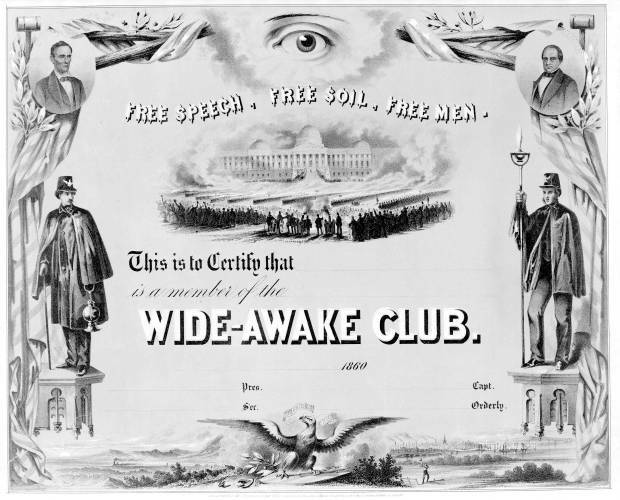 A membership certificate for the Wide-Awake Club, a Republican marching club formed in February or March 1860 and active throughout the North during the election campaign. The club was dedicated to the preservation of the Union and the non-extension of slavery. The certificate has a central vignette showing crowds and troops before the U. S. Capitol. Some of the troops march in long parade lines, others fire cannons into the air toward the Capitol. Crowds line the Capitol steps, flanking a lone figure (Lincoln?) who ascends toward the building's entrance. The certificate is framed by an American flag draped over a rail fence, with olive branches at the top. In the upper corners are oval medallions of Abraham Lincoln (left) and running mate Hannibal Hamlin (right). The rail-splitter's mallets also appear in the corners. A vigilant eye peers from a halo of clouds at the center. On either side stand uniformed members of the society, wearing their characteristic short capes and visored caps. One holds a staff and a lantern (left), and the other holds a burning torch. Below, an eagle on a shield holds a streamer "E Pluribus Unum," arrows, and olive branch. Broken shackles lie before him. In the left distance, the sun rises over a mountainous landscape and a locomotive chugs across the plains. On the right is a more industrial scene: an Eastern city with its harbor full of boats. In the foreground a man hammers a wedge into a wooden rail.